Lionel Messi is not going to make a magical recovery and will be out for three weeks, says Barcelona head coach Ernesto Valverde. 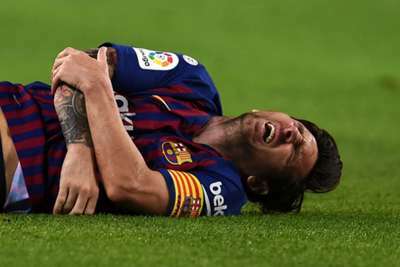 Messi fractured his arm in a heavy fall during Saturday's LaLiga win at home to Sevilla and will be out for the weekend's Clasico clash with Real Madrid. Barcelona's first game without their captain will be at home to Inter in the Champions League on Wednesday, though, with Valverde giving no clues as to how he will replace Messi. Ousmane Dembele and Malcom have been touted as potential replacements for Messi but Valverde indicated Barcelona will have to share the responsibility. "We have to find a way to play without him," Valverde told reporters. "We will certainly miss him, but we hope we miss him while winning. "You guys [the media] aren't the only ones trying to find out how we will try to replace Leo. The coaches from the other teams are as well and I'm not going to give away what we are going to do. "We can't have all the weight of Leo Messi on one player, we must do it all together. Messi is one of a kind but I think we have the players to step up and fill the vacuum. "He's the best player, what do you want me to say? We depend on him, like we depend on others, but he is the best. "The doctors say about three weeks and sometimes people talk about getting back sooner. I'd love to say it will be magic and next week he'll be back but I don't think that is the case." Messi's relationship with Jordi Alba has been one of the key factors in Barcelona's play but the left-back does not intend to amend his style without the Argentina superstar. "Nobody can replace Messi - he is different and better than everyone else," Alba said. "But we have to work as a team to go without him. "There are a lot of things people don't see on the field. I feel stronger as a player with Leo on the field. But without him I'll play the same way. "It will clearly be tougher without him but we have a good group and I expect us to do our best to play without him. "He is in good spirits. Nobody likes missing big matches like this as we just hope he misses as few games as possible and recovers quickly so he can rejoin us."